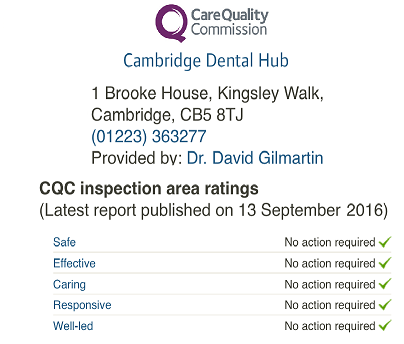 Our implants team at The Cambridge Dental Implants Practice offers bone grafting/augmentation in an ultra modern and safe environment. 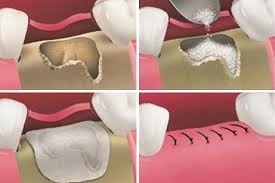 In fact the benefits of Bone Augmentation are now so well known that almost all our extractions now involve bone grafting, and so we have built up a very experienced team and ALL the dentists in the practice are now trained to do bone grafting. These are a relatively easy procedure when carried out by experience practitioners and our clinical team has a vast range of experience. Basically we use artificial bone to promote the formation of real bone. Guided bone regeneration (GBR) involves the use of a membrane that physically separates the osseous tissue from the soft tissue. Ridge augmentation is based on the principle that different cellular components in the tissue have varying rates of migration into a wound area during healing. By using a membrane as a mechanical barrier, fibroblasts and epithelial cells are excluded from the osseous tissue, so that only osseous cells are available to repopulate the healing area. There are several important elements to take into account when grafting a site, such as use of membranes, type of graft, space maintenance, suturing, flap release and design, site preparation, and post-operative medication. Without a membrane, competing cells from the soft tissue may populate the treatment area and prevent osteogenesis. Barrier membranes used in guided bone regeneration procedures can be either resorbable or non-resorbable. Non-resorbable membranes provide a long-term barrier effect but are subject to soft tissue opening and membrane exposure, which can lead to infection, early membrane removal, and compromised results. Resorbable membranes are less prone to soft tissue opening and becoming infected but some may not function as an intact barrier for extended periods of time. 4) concentration, locally, of growth stimulatory factor. We use only the very best artificial bone and tissue substitutes. We chose these because there lots of research papers showing great results. All prices for Dental Implants include implant, abutment and tooth restoration. In cases involving Implant Retained Dentures the cost of the denture is extra but depending on the number of teeth from £500 to £1000 extra. We believe in being transparent about costs so we charge £1950 for the implant, including the crown. If there is any additional charge, for example for a bone graft, then that will be billed as a separate item, and included in your treatment plan.